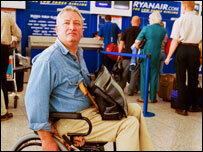 Budget airline Ryanair and Stansted Airport have lost an appeal against a decision that they must provide free wheelchairs for disabled passengers. The Court of Appeal ruled that they had a joint responsibility to assist disabled travellers between the airline check-in and the departure gate. The judges were upholding an earlier court ruling in January in a case brought by Bob Ross from north London. Mr Ross was awarded more than £1,300 after he challenged an £18 charge. Ryanair had said that since this charge was levied by the airport's owners - BAA plc - they should be responsible for providing a free service for disabled people, not the airline. But the judges ruled that both parties should share the cost of providing the service. Ryanair said it was "disappointed" that the court did not decide that BAA was completely responsible for the service. "This ruling does not clarify the position," said Ryanair solicitor, Clive Zietman. "This will be a matter of great concern to any company involved in the running of airports, railway stations, ports - indeed any building to which the public has access." Stansted Airport said it believed it had been fulfilling its responsibilities to disabled travellers. A spokesman said: "Stansted Airport... apologises to Mr Ross for not doing more to prevent discrimination against him." He said the airport places high priority on providing an accessible environment for all passengers. "The Court's decision will not affect BAA's arrangement with other airlines which already provide assistance to passengers with reduced mobility without charge," the spokesman said. But Ryanair believes that the ruling will be welcomed by other airlines who operate from BAA airports. The budget carrier said it would continue its campaign to persuade BAA to provide a free of charge wheelchair service to disabled people. This would, according to Ryanair, be in line with custom and practice at 87 of the 93 European airports from which it operates. "Today's decision vindicates Ryanair's decision to appeal the Ross case," said the airline's head of communications, Paul Fitzsimmons. "It highlights again that Ryanair is fighting on behalf of disabled passengers to force those few airport managers, such as BAA, to provide free of charge wheelchair access in a manner similar to most other European airports." The case was brought under the 1995 Disability Discrimination Act. Mr Ross was supported in his case by the Disability Rights Commission (DRC). Giving his reaction to the judgement, DRC chairman, Bert Massie, said it sent a signal to airports and airlines that disabled people would no longer put up with a second class service. "They have the firm backing of the law to ensure that fair treatment prevails," he said. The DRC is seeking compensation on behalf of a further 35 people who had complained about paying for the use of a wheelchair. DRC legal adviser Caroline Gooding said she hoped an agreement would now be reached with them without having to use the courts. Why is the Ryanair case important?